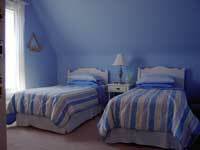 Very comfortable room with two twin beds (can be made into a king bed) and large full ensuite bath. Nicely decorated in a nautical theme. 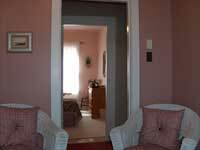 One bedroom suite/king bed/ensuite bath. Our personal favorite. This spacious one bedroom suite features a king bed, sitting room with TV and large full ensuite bath. Enjoy the sunrise and water view from your pillow. 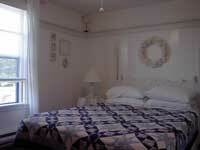 This peaceful spacious suite has a vintage style decor. Comfortable sitting room with TV and quaint village view. Large ensuite bathroom. Ideal for honeymoons or a romantic getaway. 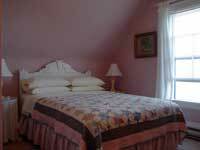 Two bedroom suite/queen & two twin beds/ensuite bath. Extremely spacious two bedroom suite. 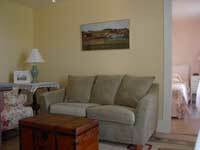 Features include comfortable sitting room with TV and views of the garden and Westmoreland River. 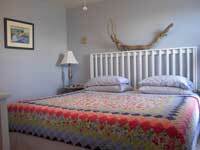 Queen bed and two twin beds. Large ensuite bath. Perfect for two couples or a family of four. Rate(s) include a full breakfast each morning consisting of fresh baked muffins, assorted breads, cereals, fruit and juice, a hot egg dish, homemade preserves, tea and coffee.